Whether you prepare meals on regular basis or just on weekends, you need to invest on a reliable cutting board to meet your food prep needs. You may not have to invest on the biggest or most expensive cutting board to do the job. But you should consider the pros and cons of different types of boards. Material – Cutting boards are usually made of bamboo, wood, ceramic, plastic, marble or glass. It is important to ensure that the board will not affect the blade sharpness. Bamboo and wood are considered to be very user-friendly to protect the sharpness of knife. Size – You can go with a large cutting board which can reduce wastage and spillage. However, it may cover plenty of space. Small board takes less space but it may not be suited well for large amount of food. You also have to consider the right size according to the space and use available. Hygiene – Sanitation is very important when it comes to choose cutting board. Some prefer wood because bacteria don’t last long in the surface But wood is prone to moisture and water seeping and it also develops cracks. Synthetic boards which are made of plastic resist bacteria on non-porous surface. But material may lose its quality over time. Maintenance – Choose a quality cutting board which is easy to clean and maintain. It should be made of sanitary materials and it remains safe when it is washed in dishwasher or by hand. 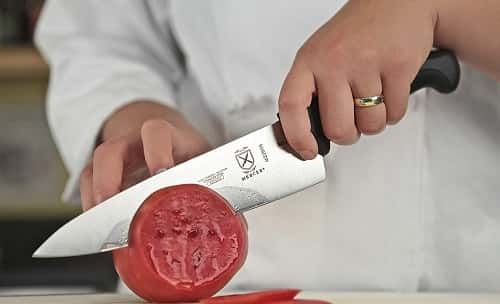 Protect the knife’s edge – The best cutting board provides not just the right surface but also the sharp edge of the knife. Composite, wood and some plastics score well in the area in comparison to marble or glass. 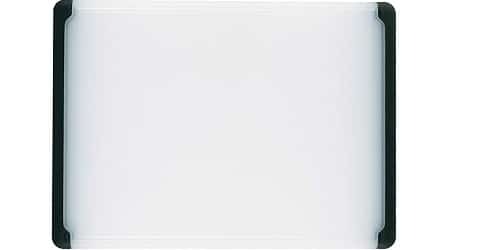 This utility cutting board from OXO Good Grips is best choice for both professional and personal use. It is made of thick polypropylene and both sides are non-porous, durable and odor resistant. The material provides protection against deep scratches and it won’t dull sharp knives. It keeps liquids contained in a juice groove located around the perimeter. Flip the cutting board and use another surface to prevent cross contamination. 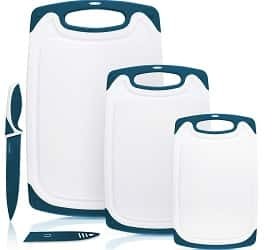 It has non-slip, soft handles for easy transportation and keeps cutting board from sliding on wet counters. It is ideal for large and medium cutting jobs and it is dishwasher safe on top rack. Are you tired of slippery cheese server and cutting board on the counter? 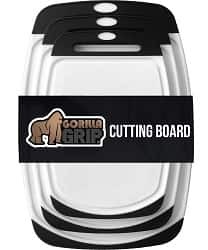 To save your valuable time and your family’s time, Gorilla Grip Original Reversible Cutting board stays secure on the counter when cutting. Others may look to be similar, but this cutting board is both durable and strong. 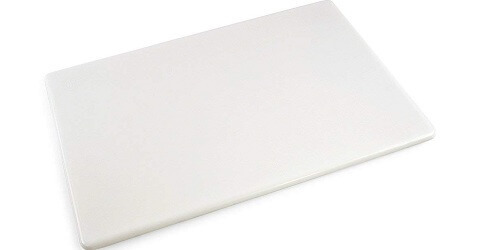 This cutting board is 1/3” thick and is made of strong TPR border to stay in place on dry and clean surfaces. Unlike other bamboo and wood boards, this cutting board is dishwasher safe. It is made of best quality materials. You can slice and dice vegetables, fruits and meats like a pro on this Farberware Poly Cutting Board. It has stick-resistant coating for smooth, easy and clean cuts. 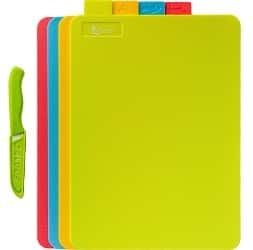 This cutting board is made of polypropylene and is BPA free. It is gentle on your knives and it is non-porous, non-absorbent and it won’t collect stains, odors or harmful bacteria. 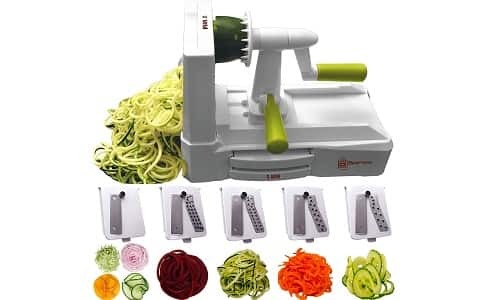 It is also considered best for slicing, cutting, and chopping poultry, meats, fish and veggies. It measures 12-inch by 18-inch and is reversible for double cutting surface and it has handhold for superior stability and control. It is also dishwasher safe and is easy to clean up and maintain. Thirteen Chefs offers heavy-duty, commercial grade cutting board designed for daily use in most demanding jobs. 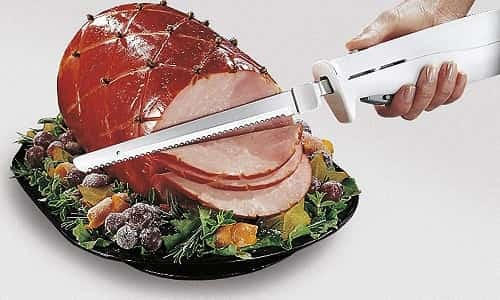 It is best for cutting, chopping, slicing, dicing, carving and other jobs without having to worry about wear and tear. 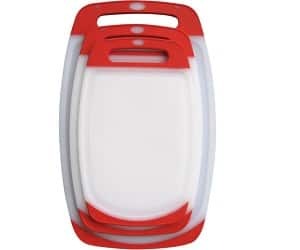 It is good for both home cooks and professionals with its high-quality and durable polypropylene design which is gentle on knives and it really makes cleanup and prep work easier. 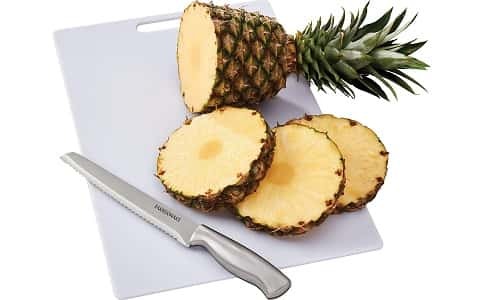 This extra large bamboo cutting board is durable, safe and quality board from Utopia Kitchen which won’t dull your knives. This is your ticket to cook with ease. 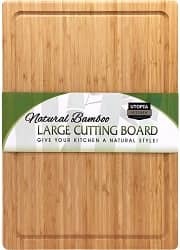 This large and thick Bamboo cutting board is best choice for food prep in the commercial restaurant kitchen or at home. 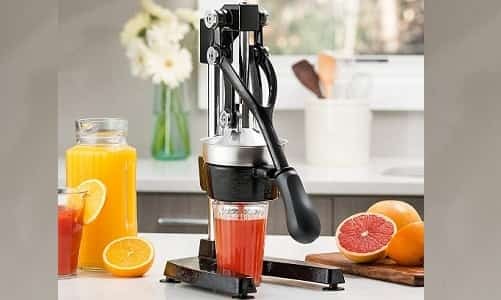 it is used to cut fruits, legumes, meat, baked goodies and bread without unnecessary sawing and hacking. This bamboo cutting board is both durable and easy to use and it has less room for bacteria to be trapped unlike wooden cutting board. It is an ideal multipurpose kitchen tool for any pro chef or home cook. Nurture the chef within you by investing in Seville Classics Bamboo cutting board which comes with seven flexible color-coded cutting mats and food icons. Bamboo is hard and renewable material which is more sustainable, stronger and easier on your knives than hardwood chopping blocks and cutting boards. 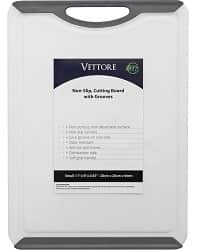 This board has rounded corners and ventilated compartment for mats of cutting board with a different rectangular design. The grooves are easy to grab even when they are put on flat surface. These colorful mats are designed to fit well on top surface of the board. You can use them as tray to move food, bend them in a funnel to plate chopped ingredients or as cutting area. It is also easy to clean. Wash with mild detergent and warm water and let it air dry. All of the cutting boards from Bettore are made of non-porous, high quality polyethylene which can resist deep cuts but it won’t dull your knives. All of these boards are stain resistant, dishwasher safe, and it won’t degrade or warp over time. It is the best gift for graduation, birthday, wedding anniversary or other events. Resort Chef cutting board comes with food icons for poultry, meat, vegetables and fish to help avoid food poisoning and cross contamination. Each cutting board is color-coded in pleasing bright colors. It is made of in-built Microban antimicrobial protection which resists the growth of odor-causing and stain causing bacteria, mildew and mold. Each cutting board stacks well and don’t take much space. It is also easier to store in cabinets and drawers. These cutting boards are made of FDA approved and BPA free materials. These boards are certified to offer safest surface to you and your family. Made of best plastic material, Chef Grids Cutting Boards are built to last lifetime. This set comes with full-size, stainless steel knife with sheath. This set is what you need in your restaurant or kitchen. It is best to cut red meat, fruits and vegetables and its non-slip grip prevents nasty and painful accidents. Each cutting board in this set is 3/8 inch thick so they are easy to store and maneuver. It has deep juice groove on all of the three boards to prevent spillage and retain juices. It has drip lip to catch all the juices so it won’t get the counter dirty. It has thermal plastic rubber edges for stability. Wood Vs Plastic Cutting Boards: Which is Better? Cutting boards made from plastic are not that safer as compared to wood. As per the studies, wood is found to be a lothygienic in the longer run. This is due to the reason, wood has got a porous surface. Such a feature can’t be seen in case of a plastic cutting board. Plastic boards are found to be more repellent to bacteria.Such an assumption doesn’t consider that a cutting board made from plastic can easily get the scar from day to day use. Wooden cutting boards are a lot more durable and less susceptible to wear and tear. As per the study conducted on wooden and plastic cutting board, these boards have a lesse rnumber of salmonella bacteria as compared to plastic cutting boards. On a wood-based cutting board, it is found that the bacteria travel down under the board surface where these bacteria are unable to pass and so they eventually die off. On a plastic cutting board, bacteria get caught up in grooves of the knives. This is the place that is nearly impossible to clean whether you use cleaning by a dishwasher or by hand. So,the good side of a plastic cutting board is that they are quite easy to disinfect, but the drawback is that any worn plastic board can easily hold onto bacteria. As per the official opinion of the FDA, cutting boards made up of wood, as well as plastic, are completely safe until they are properly cleaned and replaced frequently. When boards get excessively damaged or develop difficult to clean knives grooves, then it indicates that you must get a new one. If wooden as well as plastic cutting boards are susceptible to bacteria when not taken proper care and regularly replaced, then the thing that would differentiate them is its longevity and preference. Not just the wooden board last for a longer time but also help in keeping the knives in the best condition for a longer time. This is because boards made using hardwood would not make the blades dull as fast as it happens in the case of a plastic board. We would like to go for a cutting board made from hardwood like beech wood or maple. This is because it doesn’t get any scar as seen in the case of plastic board. Also, you do not need to get it replaced often if you perform the best maintenance tasks. Cleaning and caring the cutting board is very important as long as you need the cutting board to be long lasting and healthy. If you are using wooden cutting board always, make sure to wipe clean the cutting board after each use and then with a wet cloth wipe the board until the deposits come off. Once you are done doing this, to keep the wood soft and efficient rub the board with oil, it can be mineral oil or bee wax. On the other hand, if you are using a plastic or any other material cutting board, always soak the cutting board in warm water and then wipe clean the cutting board. We also recommend that you wash the cutting board in Luke warm soapy water. Make sure you wipe clean and dry the cutting board before storing it somewhere. All in all, you should go with the cutting board which looks elegant and is made of quality material. Choose the board which is knife friendly which won’t affect knife’s edge. Cutting boards are good for slicing, dicing, hopping and cutting fruits, vegetables, meats and other items. These boards can be made of wood, bamboo, plastic etc. These have non-slip edges to avoid slippage and the antimicrobial, non-porous and antibacterial surfaces can prevent microbes, germs and bacteria.